Wholewheat spaghetti meets oodles of cheesy creamy goodness. How do we make it way more nutritious and easier on the conscience? Simple – add in a handful of green peas & my new adoption aka nutritional yeast to substitute calories from cheese/ make it vegan and add nutrients. Did I already mention the ‘ready in a jiffy’ part? How to make pasta a healthier meal choice when you’re out in a world that constantly makes you feel guilty about carbs? Well, you start by knowing that carbs are NOT EVIL – not if you track them and can portion them wisely. Make it healthier still by using whole-wheat or buckwheat noodles, thus avoiding the simple carb-overload coming from ‘refined-flour’ pasta variety. If you’re allergic to gluten, there’s good news for you too – you could use rice noodles (the same variety used for Pad Thai noodles recipes) for this dish and still enjoy its cheesy goodness. I know I said cacio e pepe (which literally translates into salt and pepper), but I’m too much a sucker for balanced nutrition, and hence I added fresh green peas and nutritional yeast flakes to bring in fiber and loads of useful mineral and vitamins. 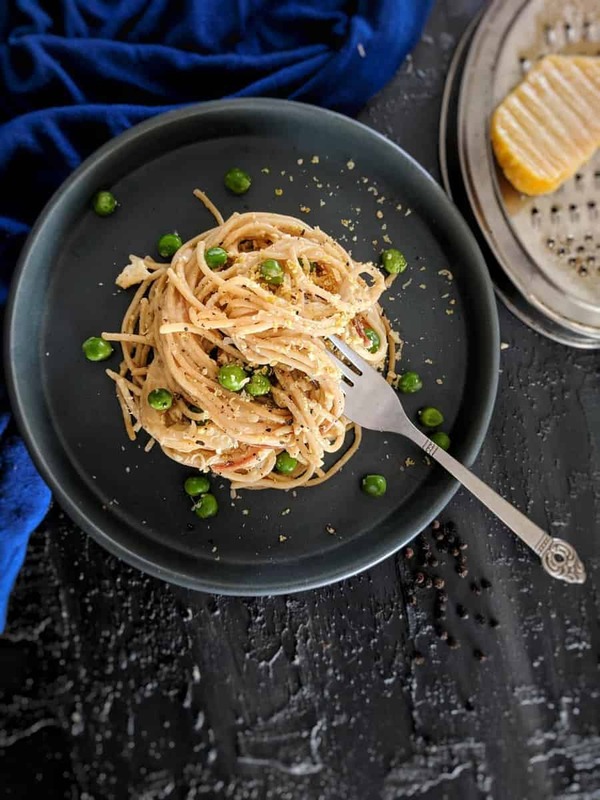 Although the golden rule always applies – too much of anything is bad and sadly pasta – however healthy – is not an exception to this rule. Do use your good judgement and use moderation and portion control to stay healthy and fit! Looking for other healthy cooking ideas? Try my Spinach Whole-Wheat Pasta in Avocado Mushroom Sauce, Creamy Barley Risotto, Healthy Mango Panzanella Salad and let me know what you think! I’ve been getting some questions about the importance of nutritional yeast and how it tastes. Addition of nutritional yeast to food is not a new concept; Instagram and other culinary websites have been gung-ho about it for a while now. Not only can nutritional yeast help you substitute cheese if you are a vegan or counting calories, it’s also packed with amazing flavour profile and is a powerhouse of vitamins and protein. It’s a good source of vitamin B12, something that vegans miss out on since it is present only in dairy and meat. Not to mention, you get four grams of fiber along with minerals like zinc, folate and iron with just one tablespoon of nutritional yeast. Willing to give it a try yet? Heat salted water in a pan and add pasta as the water comes to a boil. Add 2-3 drops of oil to prevent pasta from clinging. Cook till the pasta still has some bite to it, or in other words, al dente. Reserve some water for the sauce and drain the rest. Heat oil/ melt butter in a non-stick pan and add minced garlic, green peas and pepper. Add reserved pasta water, cheeses and stir until they melt into a sauce. Add pasta and toss well to ensure the sauce coats it evenly. Sprinkle nutritional yeast flakes and paprika flakes on top.